NAHB’s National Sales and Marketing Council (NSMC) has announced Silver Award Winners for The Nationals new home sales and marketing awards, recognizing homebuilders, developers, associates and consultants, at an awards ceremony on January 10th at Hyatt Regency Orlando as part of the International Builders' Show. 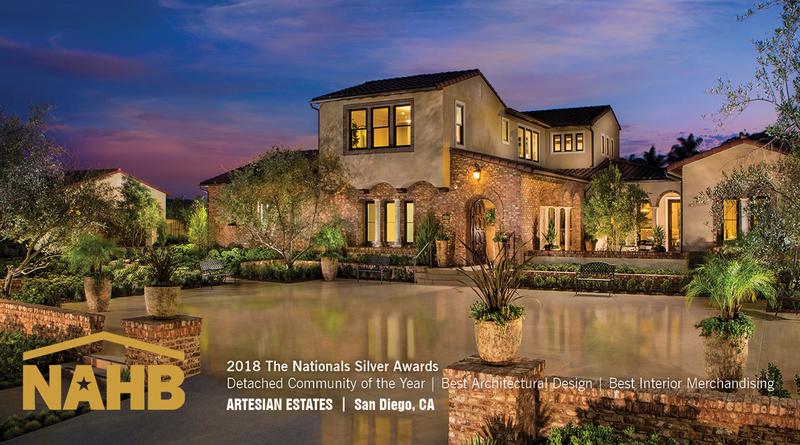 Artesian Estates is a luxury, estate-style collection of 39 single-level and two-story homes on the western-most edge of Del Sur. These oversized residences range from 4,223 to over 5,600 square feet and feature grand entertaining spaces inside and out, chef-par kitchens, incredible owner’s suites, bonus rooms and optional guest suites or private cabanas. Juniper at Beacon Park offers oversized single-family homes within a master planned community ideally suited for young families. The homes feature indoor/outdoor living options, perfect for everyday living or entertaining guests. All plans feature a dirty kitchen and multigenerational suites, with the plan 1 elevation offering a subtle contemporary twist on traditional architecture. The community offers the enjoyment of an onsite neighborhood park with adjacent community pool, spa, and tree house. The Nationals salutes and honors the best in the building industry for their determination, integrity, creativity and endurance. During a three-day judging process, a panel of seven industry professionals from across the country determined the Silver and Gold award winners from a field of over 1,300 entries. Gold Award Winners are selected from Silver Award Winners, which represent the top vote recipients in each category. Among the largest architectural firms in the San Francisco Bay Area, Dahlin Group Architecture Planning is a full-service architecture and planning firm with proven expertise in residential architecture, community and recreational facilities, commercial buildings, urban design and custom homes. Noted for its command of site-specific housing types, the firm is widely recognized for sustainable planning and design and diverse urban and suburban development achievements. Its commitment to green and sustainable land uses and building designs is underscored by TOD, redevelopment and affordable projects, and by expanding LEED accreditation for principals and senior architects/planners. DAHLIN headquarters are in Pleasanton; the firm maintains offices in Irvine and San Diego, California; Bellevue, Washington; and in Beijing and Shanghai, China.